Did you know that water can cut stone and steel? Water jet machining is a precise, very powerful process which is able to machine almost any material provided that some amount of preparation takes place. While most of us don’t have access to a water jet cutter, it’s still good to know about them if you’re interested in the process. So, let’s hop right in and we’ll introduce you to the subject. How Does Water Jet Machining Work? Water jet machining uses high-pressure water in order to cut materials. The pump forces the water through the nozzle and releases an extremely thin amount of water which can reach pressures of 55,000 PSI. Most often, an abrasive is also placed in the solution. Abrasive cutting with a water jet is able to cut through basically anything which is softer than the abrasive material used. Pretty much everything has been tried over the years for water jet cutting but the current gold standard is almandine garnet. This form of garnet is a naturally occurring mineral, so sourcing it as a pure material with a relatively even particle size is very important. The process is pretty simple: the water hits the surface and due to the high pressure and relative density of water, it removes material. With an abrasive material involved a water jet can often cut through just about anything. Stone, concrete, and tile are also cut cleanly and relatively quickly through the water jet process, as well as hardened metals. Water jets are extremely precise when it comes down to it. The only process which will beat out the 1/100th of an inch kerf that’s achievable with water jet cutting is laser cutting. Because it’s a cold cutting process it’s also important to note that a water jet cutter can’t overheat. They generally use room temperature water mixed with an abrasive in order to achieve their cuts, lowering the amount of energy required. Cold cutting also prevents heat deformation which can occur with regular metal saws and plasma cutting. This also means that if you’re using a mill or lathe to finish a workpiece after a water jet machines it you lack any sort of heat temper. 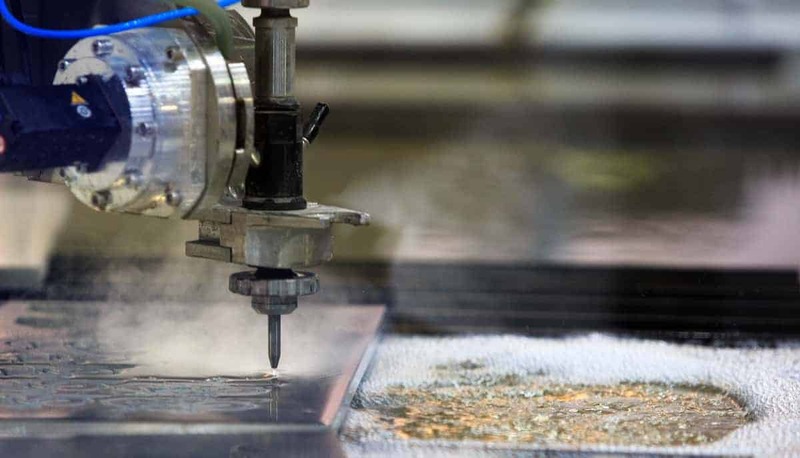 With lasers and plasma cutting, you’ll be removing material which has already been heat-treated which can pose difficulties further down the line. The biggest advantage of using a water jet is that it can cut nearly any material. The same machine can cut ceramics, metals, and soft materials like leather and wood. Also, while they’re not quite as flexible as a 3D printer, high-end water jet machines can also cut 3D patterns through a CNC process. There’s nothing quite like it in the machining world. Modern machines are extremely precise, result in little material loss from the stock, and the machines are extremely versatile. Of course, no machining process is perfect or everything else would be obsolete. When it comes to cutting metal water jets actually don’t do all that well for thinner parts. The force of the water can cause deformation when a material is malleable and thin. They’re also extremely messy to run when compared to other precision machining processes. A good sump system is required and if a high-end abrasive like garnet is used there also needs to be a way to filter it out of the water so it can be reclaimed. Water jets have a tendency to eat through parts quite quickly as well. The nozzles and other pieces wear down more quickly than many comparable processes, which results in a higher running cost per piece cut. This is especially true for abrasive hydro-cutting, where the materials used have to be harder than the material which is used for the abrasive. That generally means gems or extremely specialized metal alloys make up the parts. The biggest disadvantage, however, is the speed at which a water jet runs compared to other machining processes. This is compounded when you consider that they’re also more expensive to run, per hour, than things like laser cutting. While stone and ceramic materials cut with a waterjet will be faster than even the best lapidary saw when it comes to cutting metals and organic materials a waterjet doesn’t have any sort of speed advantage over less expensive processes. If you’re interested in adding a water jet cutter to the capabilities of your fab shop, there’s good news and bad news. The good news is that it’s remarkably easy to find modern water jet cutters. This company, for instance, produces top-of-the-line cutters that are easy to order online. They also tend to be on the expensive side. Water jet machining wasn’t viable for precision pieces until the advent of the microprocessor, which means that not only will you have to have a machine which can handle the pressures involved… you’re also paying for the advanced electronics which control the cutting head. If your fab shop is in the right place and has the right customers then it’s fairly easy to make your money back but the upfront costs for a modern water jet cutter can be pretty high. Water jets haven’t yet hit the consumer market for home use. That means those who want parts cut are almost always going to have to go through a fabrication company. There’s a lot of money there for fabricators who are willing to invest the time and money required to put one in their shop, but you need to be aware of the above information before you make a final decision. We hope that our beginner’s guide to the fabulous world of water jet machining has given you the information you need. If you enjoyed this article, why not read some more in our technology section?